The global variable frequency drive (VFD) market is projected to reach USD 28.6 billion by 2024, at a CAGR of 5.3% during the forecast period. This can be attributed to the advantages it offers such as, reduce energy consumption and reduce energy costs, increase production through tight process control, extend equipment life, reduce maintenance, and others. Variable frequency drive is a kind of motor controller which drives an electric motor by varying the voltage and frequency supplied to the electric motor. It is also known as adjustable speed drive, variable speed drive, and AC drive. On the basis of type, the market is classified into AC, DC, and servo. The AC type category dominated the variable frequency drive market, as these drives are extensively used in AC motor applications owing to their variety of characteristics. Along with that, the increasing investment in the infrastructural activities and growing need of energy efficiency is anticipated to propel the market growth in the coming years. Based on voltage, the variable frequency drive market is segmented into low voltage and medium voltage. During the forecast period, the low voltage category is anticipated to grow at the fastest rate in the market. On the basis of power range, the variable frequency drive market is classified into micro-power drive, low-power drive, medium-power drive, and high-power drive. Among all these, the low-power drive is projected to dominate the market during the forecast period. Owing to the advantages it offers such as low capital cost, better process control to the industries in which they are used, are among the major factors driving the growth of this category in the market. On the basis of application, the market is categorized into pumps, fans, compressors, conveyors, and others. The pump application segment is leading the market and expected to hold the largest share in the variable frequency drive market during the forecast period. As pump is one of the most used equipment in the industry. Based on end-user, the variable frequency drive market is categorized into industrial, infrastructure, oil and gas, power generation, and others. Of all end-users, the industrial category is the major user of the market and expected to hold the largest market share in the market during the forecast period. This can be attributed to the increasing demand of electric motors in different industries including marine, pulp and paper, cement, and others. 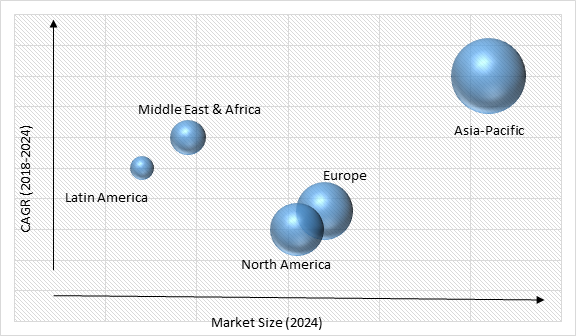 Need of energy efficiency, increasing use of variable frequency drive in various industries, and favorable regulatory environment are the major drivers witnessed in the market that are driving the market growth. Electric motors are responsible for almost 65% of the power consumption in industry. This device can reduce energy consumption in the facility by almost 70%. It also improves the product quality and can also reduce the production cost. Availability of cheap and low-quality products is the main challenge identified in the variable frequency drive market, which can potentially hinder the market growth during the forecast period. Various cheap substitutes and fake products are available in the market at a low-cost, which has the ability to attract the customers, which is posing as a challenge in the market. Oil and gas industry stagnant growth due to declining oil prices has resulted in a decrease in exploration and production activity across the globe, which has impacted the variable frequency drive market and also impacting the businesses of major players operating in the market. Globally, Asia-Pacific is the largest variable frequency drive market and expected to register the highest growth in the market, owing to the significantly increasing investment in the renewable energy, positively affecting the growth of the market. Countries such as India, China, and Japan are anticipated to be the largest contributor in the market growth, owing to the massive investment in the manufacturing industries by the government of these countries to support their economic growth. Some of the key players operating in the variable frequency drive market are ABB Group, Fuji Electric Co. Ltd., Eaton Corporation plc, Crompton Greaves Ltd., Danfoss Group, Schneider Electric SE, Rockwell Automation Inc., Siemens AG, and Nidec Corporation. 12.9. Fuji Electric Co. Ltd.